Can't believe that in about 1 month, I'll be out of school officially. As mentioned before, I'm not sure if I'll be furthering my studies. I plan to enjoy my life while I can since I haven't been able to do that over the past few years. It's always been about school, blogging and modeling. At the moment, as you all are aware, I am busy with my school's internship program. Many of you have been constantly asking me what it's all about, well... I can't give it away due to a school's policy but I must say that it's totally different from what I'd expected. I study fashion. Ask any fashion/design student and they will all tell you the same thing. What most people think of the fashion industry isn't exactly what it seems. It isn't always about being glamorous on the runway or working closely with supermodels. Most of time I'm required to run errands for my employer, which inevitably means travelling around the country. Some times, without time to take a break. The working world is entirely different from school life. You can't afford to depend on others cause there really isn't anyone around that would take care of you around the clock. Through all my experiences of being involved in the working industry, I've come to realize that I might choose to open my own business instead. It's just not in my nature to work under someone. I've tried on many occasions but I think (as cliché as it may sound) my life would be a lot more complete knowing that I own something big. The thought of the future may be scary and I'm sure many of us (myself included) are at the crossroad where we just don't know which path to take. I guess we should all just go ahead with whatever comes our way, take chances and remember to enjoy life while we do it. I've been kept awake on some nights thinking about it and honestly, no matter how strong my dream to own a business is, I think that it is still important to have some sort of experience working in a company, around people. It's kinda like school where you learn skills that the books can't teach you. And I think that since I aspire to be a boss, it is important for me to know what it feels like to be an employee first. In this way, I am aware of the needs of my future employees. This will help me be a better boss, knowing how to help my staff be happier and better at their jobs, increase their productivity (not squeezing every ounce of time from them) and grow my business on positive energy. With all that said, I hope that my future employer would do the same for me. I aspire to be an owner of my own company in future and I will keep in mind that my future employees are human too. 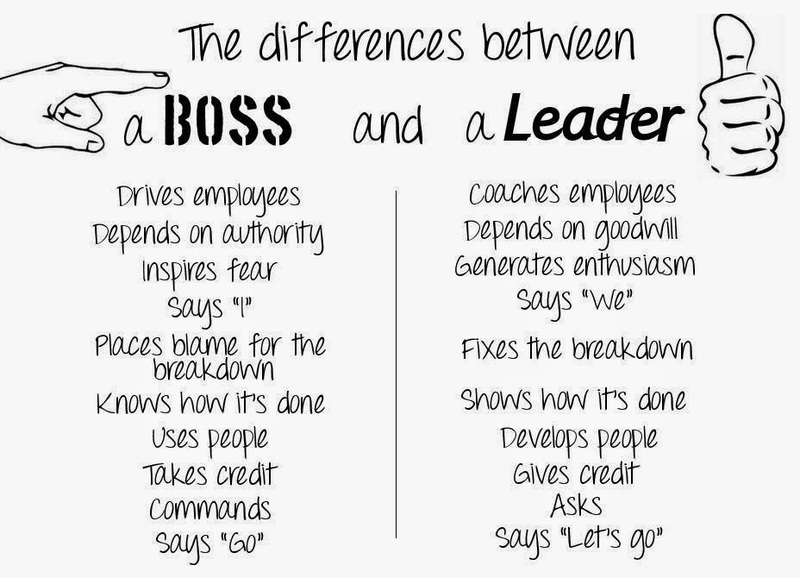 From my experiences so far, I will make sure that I am a leader and not just a boss. I guess the following image will give you an idea of what I mean. I usually don’t follow what politicians say but I totally felt NTUC chief Lim Swee Say summed up how positive energy shouldn’t just come from employers and staff, but customers "should remember that service staff are people too". 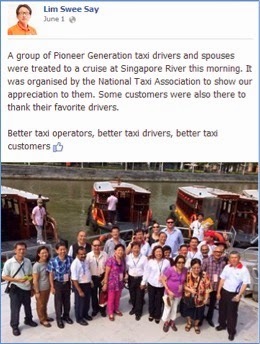 For example, how many times have we heard nasty complaints about taxi drivers? But do we also take crappy customers to task when they cheat taxi drivers, beat them up, vomit in their car or become sarcastic when the drivers asks for their preferred route? Shouldn’t we be more appreciative of these taxi uncles and aunties who ferry us around and hold our safety in their hands? It really is important that customers interact with staff with a smile on their face and not expect too much. Working at A&F two years back taught me how it feels like to handle nasty customers with unreasonable requests. One time, I was asked to follow a customer around the 3-storey building carrying his pile of merchandises, as though I was his personal helper. Honestly, I don't mind going the extra mile for any customer but it just wasn't a pleasant experience because he was so rude and bossy. It really doesn't hurt to smile and greet the staff back you know? On another note, some of my friends lament that with Singapore's growing population, will we even be able to find a job easily or if we do have a job, will we be able to look forward to a promotion soon? I've heard of many instances where people are constantly rejected due to the vast amount of people living in Singapore at the moment. Not a day goes by where we don't hear locals complaining about how difficult it is to get the job or position of their dreams since they have to compete with foreign talents. That’s why getting good jobs and pay is such a big worry to students like me. Union leaders like Patrick Tay are calling for more protection for PMEs, for government to ensure we are considered fairly for jobs before companies can hire foreign talent (we’re so overcrowded in the first place). And since the world is constantly changing, can companies readily make second skilling opportunities available to us, so we can learn good skills to be even better at what we love to do? Well, I can't say much about what I expect from my job in future since I don't exactly have a taste of it yet. But I am certain I would like a form of job protection, opportunities to progress etc. I guess, I just hope to be able to work in a healthy environment with an employer that's admirable and hardworking on his/her own. It's kinda like school where you would work extra hard on a subject just for the teacher that you like. Also, I hope that through my commitment to the job and the assets I've given to the company over time, I may progress as well. Nobody wants to stay stagnant at the same position forever right? I'm glad that NTUC and unions are stepping up to protect our interests and our future. And thanks for reading this rather lengthy post. As you can see, it's the featured dress of this collection cause it's just too freaking stunning. Sure, bare back dresses are such a craze these days and you can never have enough. I just find the criss cross details of this dress really interesting. Kinda looks like it was inspired by an inverted hexagram huh? It's also really comfy thanks to it's super soft cotton fabric. Really, a piece that you won't wanna miss. Lately, I've been into tweed a lot (erhem, check out the bag featured above). But tweed can get pretty uncomfortable especially if it's really thick. But this one's super comfy and since it features a much different, softer fabric at the back, I don't feel an itch at all. I love how easy it is to pair this with almost anything too! 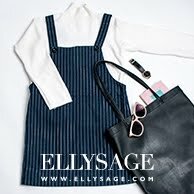 Loveige is a spunky online fashion boutique based in Singapore. We aimed at offering high-quality, moderately priced and diverse product range that are trendy and stylish to our customers. We believe in partnering with our customers, employees and community and we aim to become a regionally recognised brand name for the love of Fashion. Besides offering versatility and variety of clothing to our valued customers age from 18 to 40, we also believe that “Giving is Receiving”, we are committed to donate part of our profits to a charity of our choice and spread love to the community. How in the world do you say no to such a gorgeous maxi dress?? First of all, it has such a STUNNING colour that will definitely make you stand out from the crowd. Next, it fits perfectly and it's length is just right! I love how I can wear this to almost any occasion too- perfect for a simple dinner date, brunch appointment or even a special event. Available in black as well^^ Highly recommend this piece if you're looking for a new maxi dress. Ka-ching, Ka-ching, bling, bling, bling!!! Madly in love with this sequin halter dress. There's so much elegance and poise in it! It'll work great for a special occasion and you'll know for sure that you're neither underdressed or overdressed cause it's almost perfect. I'd picked Gold but it's available in black and blue too. The Owner of LOVEIGE emphasized: "We are aware that competition for e-commerce apparel shops is very strong these days and to make ourselves stand out from the rest, we vow to make a difference to the shopping experience of consumers. Besides offering more unique designs, we treat every customer like our friend. Going the extra mile for each and every customer is very important to us because we were consumers too, and we understand the frustrations that one may face while making online purchases. LOVEIGE aims to minimize those unnecessary frustrations (inflexibility of certain rules and regulations and rudeness of representatives of retail outlets) and enhance the shopping experiences of customers." LOVEIGE is having a 20% storewide GSS sale*, do hop by and get something for yourself! Enter Discount code GSSLOVEIGE upon checkout for 20% off! Wanna stand a chance to be one of the 3 lucky winners to win a $25 voucher each?